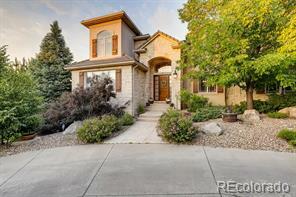 Spectacular mountain views with a high end remodeled home. Welcome to this fabulous raised ranch with walk out basement! Kitchen, great room, study, master bdrm all face west w/views! Gorgeous kitchen w/marble counters and b.splash, Viking range, Thermador fridge, farm apron sink. Work of art wood and iron curved stairs. Master w/sitting area, fireplace, bath w/radiant heat floor, Victoria Albert claw foot tub, 2 walk-in closets. Fin basement w/wood floors, wet bar, fridge, craft room and extra room.